Second Trip To Maui With Harper - Summer Fun Part 2! Kurt had to come back to LA early so Harper and Gamma and I had a lovely time, just us girls. One of the main reasons I was there was to attend the 50th anniversary of Seabury Hall. There was a gala event Friday, July 4th. There were old friends to see and catch up with and new friends to make. All of us part of that amazing place, Seabury Hall. Charlotte Melrose was there, one of the most important women in my life! Of course I burst into tears seeing her, that's how I roll. Harper got to see Seabury too though I wasn't able to introduce her to Charlotte. Sitting in the same spot I spent many a study hall, out on the bench, under the jacarandas, waiting for the next bell to ring. Harper got to spend the gala evening with the childcare gang in Cooper House (the building behind her). She had a GOOD time! "Had Pizza!" That's my girl. The next day, Sandi asked us to come pick apples at her place in Kula. Perfect weather for picking! Harper picked away like a pro. Then I baked them all into a crisp for dessert! And yes, even though I forgot to take them out of the oven, half an hour after the timer went off, it was still yummy! Sandi also had dahlias to pick. We love dahlias. One morning we met a friend for brunch in Makawao. On the way home we stopped at the Hui to see mom's photo in the Paniolo Country Exhibition. There is a stick house/art piece outside by entry that Harper had a good time exploring. Morning chit chats on the lanai. It was a nice visit. Harper LOVES the beach! She talks about it a lot. I guess we have beaches here in LA. I've heard stories. The rest of summer is full of potty training and music class and looking forward to the wonders that will be nursery school in September! Dear Auntie Martha died a few weeks ago. She was my grandmother's sister and the last of her siblings (and siblings-in-law). She had a wonderful life and I'm so happy I got to be a small part of it, especially in these last fifteen years or so. She was a gracious and warm hostess, always, at her beautiful ranch house (a house I would emulate if ever I got the chance to build my own). I loved her sharing of family history with me when I was full of questions. And so much more. I'm so sad and will miss her dearly. But she will always be near, especially at Christmas, when I put her ornaments on our tree. Second Trip To Maui With Harper - Summer Fun Part 1! Here's an awesome (read: "goofy") picture from the flight over. We both have similar expressions and it just makes me laugh! At the airport, Harper helped Kurt with the luggage. After the luggage was opened and shorts applied to our sharkbait white bodies, we headed down to Baby Beach and Harper was SO excited about the ocean she would have just stayed there all night. She was really peeved that we had to leave without going in all the way. But the next morning, we packed our beach bag and headed down. The tides were perfect and Harper was fearless! She really loved being in the water and we kinda had to keep a close eye on her as her swimming skills are not as strong as her enthusiasm. But sand castles were also a lot of fun. We'd make towers and she would Godzilla right through each and every one. Ultimately, swimming with Big Papi (no, not David Ortiz) was the most fun. After the beach, we got to go to Star Noodle in Lahaina! I was so excited about this after hearing only great things and also cheering for Sheldon Simeon on Top Chef. The place did NOT disappoint. The best was the Ahi Avo - chunks of raw ahi and avocado in a chile-spiked dressing. DAMN. Okay the noodles were awesome as well. I wish I could order in from there every day! If you go to Maui, go to Star Noodle and get there early! Gamma kindly bought some toys for Harper, a golf set and a bowling set. We created a new game called "Bolfing" and got a few good rounds in. Later in the trip, Harper created an alternate version I like to call "Water Bolfing." She excels at it. Growing up in Hawai'i is quite different than growing up in a lot of places in the US. One big difference is the kind of desk accessories you need. See if you can spot the difference. So I was making green beans for dinner last night and while tossing the hot beans with butter I suddenly flashed on dinner at my GrandmaJane's house when I was a kid. 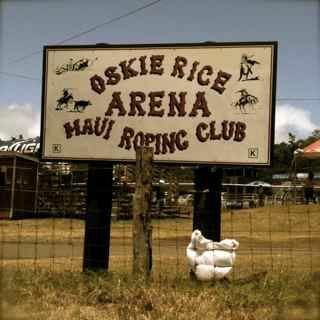 She and Grandpa O lived in Makawao and I always loved going to the big ranch house for dinner. I especially loved her green beans. Her secret? Look at that label: "Pure Monosodium Glutamate" MMMMmmmmm good! Seriously, you just used to shake it on food like salt. Awesome. I have so much to catch up on, blog-wise, but had to get this out first. Envelopes and Stationery and Paper, Oh My! There is a blog I read by my friend and Seabury carpooler, Melissa, called "Julia's Bookbag." (Different Julia!) Every Friday she does a "Cool Stuff I Like" post and this week included a link to a post about amazing envelope inspiration. It is a collection of envelopes created by various artists. It brought me back to the days of intense letter writing I had growing up. Well, I say "intense" only because in this digital age, it seemed intense that I wrote so many letters back then. I still write my fair share now, actually. I love sending notes and thank yous and birthday cards in the mail. I love shopping for paper and cards and stamps and stickers. My parents got divorced when I was five and not too long after that my dad got remarried and they all (Dad, stepmom, two oldest sisters and Lucy, the best dog in the world) moved to the Big Island. My mom and my next oldest sister and I still lived on Oahu, then later Maui. I only got to see that side of my family two or three times a year (usually summers and New Year's Eve). So Dad and I wrote letters. Lots and lots of letters. I think my mom indulged me with colored pens and all kinds of stationery*. (Just as she indulged me in books!) I loved getting letters and I loved writing and sending letters. In high school I acquired about twenty West (at the time) German pen pals and seemed to constantly be writing letters, which I loved. (I still write to 3 of them!) Going to the post office in Paia to get mail was also so exciting. To see what might be in the box addressed to me was a thrill. That post office is no longer a post office but Box F will always be a strong memory in my mind. It was my grandmother's address, once upon a time, then it became ours. Now there is a friend in Northern Ireland who has a daughter not much older than Harper. We promised we would have the girls be pen pals. We've written a few letters to each other in the last two years, but man it's challenging! So I am going to write a letter and mail it today. I PROMISE! *Trying to remember where we might have bought the stationery from on Maui. Liberty House? Hopaco? Shirokiya? God I loved shopping at Shirokiya! Hot Manapua and Hello Kitty pencil boxes and paper and stickers!! We had a great birthday weekend with Harper. Friday saw the arrival of her new old-school Red Flyer Tricycle (thanks Uncle Glenn and Aunt Joanie!). She has not quite gotten the hang of pedals, but Dad pushing is a good thing. Just for genetic comparison, here is me at 2 with my awesome three-wheeler! Harper and Harper enjoy last year's Red Flyer Wagon. My mom sent this to me recently and it brought back some great memories. Going to the airport or just to town the back way was so much fun! Especially on days when the top was down on mom's red Bug. Those planes would be right over our heads. Awesome. August has been busy and mostly good fun. Swimming continues and I'm amazed at how after five weeks of lessons (one lesson and one practice each week) Harper is more and more comfortable in the water and doesn't grab for me hardly at all. She still wears floaties and fins, and is getting better and better with the kicking and paddling. Plus just seeing her in that cap kills me every time! Every time I put her sunsuit on I call it her Elvis suit. I love this picture that Kurt took as the girl next to us was so funny and chatty. I'm making a Jen face for sure. But with that face, it is hard to complain. That FACE! And just a thought -- these toys should probably not be sold or given to households with those that suffer from combat related PTSD...just sayin. We got an old chair recovered. I've never done that before and the guy we were referred to was awesome. Cheap, cheerful and FAST! With pick up and delivery. We were going to get a brighter, bolder pattern, but then Kurt brilliantly remembered that we have an almost 2-Year-Old...so we opted for darker for now. I was trying to figure out why in the world I remember kite flying being so easy as a kid. Then it dawned on me that, um duh, I grew up where the weather report said "Tradewinds 10-15 mph" EVERY DAY. Much more helpful for kite flying than LA where you barely get 6mph. And the sunflowers are starting to bloom and that always makes me happy.